The weather gods smiled on us this year. 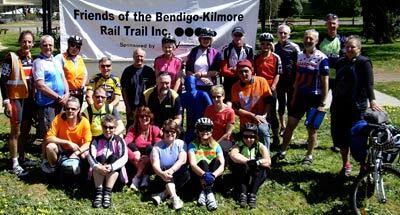 It was a perfect day for 24 Friends and intrepid cyclists to explore the rail trail to Axedale and then loop back through the Wellsford Forest. Following a very wet winter, the council has done some patch-up repairs on parts of the rail trail, which should be followed by some significant upgrades when work on the extension gets under way. While the approaches to the swing bridge across Axe Creek will also be upgraded, there are no plans to replace the bridge itself. That poses a problem for horse riders who can’t cross the creek – something to be noted and passed on to planners. We stopped at the original 96-mile post, one of three remaining telegraph poles left from the original railway and then at the site of the Axedale railway station and learned of their history from Ken, Garry and Les who make industrial history quite fascinating. Coffee, tea and biscuits awaited us at Axedale before we set off into the Forest for the return trip. The rain has brought out a wealth of gorgeous flowers which brought the party to a halt at one spot for photos. Lunch stop was at the site of the old eucalyptus distillery at Gunyah picnic ground. Then it was back past a very full Mahers Dam in the Bendigo Regional Park to arrive in Bendigo in time for those wanting to watch the ‘final’ AFL Grand Final. We’re looking forward to next year’s ride already. All smiles at morning tea at Axedale.